As every other Opensource application Pimcore also provides many available settings you can configure whenever you need to. In this particular tutorial we will provide a brief explanation and guidance on how the General and the Localization settings should be configured. FastComet Pimcore Hosting package is specially optimized to provide fast and secure hosting environment for Pimcore with free 24/7 Pimcore Technical Support. In order to access all the settings types provided by Pimcore you will need to navigate to Settings>System. 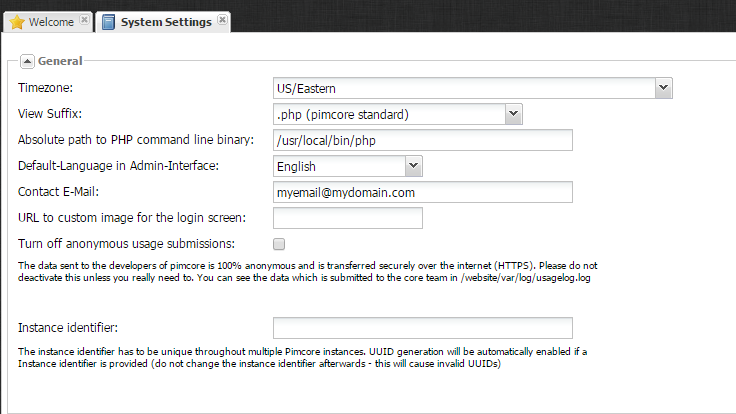 Timezone – here you can configure the time zone you would like your Pimcore application to use. View Suffix – here you can configure the suffix of the view files your Pimcore application will be using. The available suffixes are .php which is the standard extension and the phtml which is Zend Framework standard extension. Please use the one which is most suitable for you. Absolute path to PHP command line binary – here you should configure the native path to the php binary which in all our shared servers is /usr/local/bin/php. Default-Language in Admin-Interface – The default language which should be used for the Admin area. Contact E-Mail – The email address which can be used from your application for reports and other critical information. URL to custom image for the login screen – here you can specify any custom image you would like to have displayed on the login screen of the admin area. By default the image there is the Pimcore logo. Turn off anonymous usage submissions – By default all the data your application submits to the developers of Pimcore is submitted absolutely anonymously. If you would like this disabled please check this option. Once you are done with the configuration of these options please use the Save button which can be found at the bottom right corner of the page. The Localization settings section is the second section of the System Settings page and there you will be able to specify the content language for different type of components on your website. The default language is English, however you can add as many as other languages you would like to and then to even import the language CSV file if you need to. The process of adding a new language is relatively simple. The only thing you will need to do is to simply choose the language from the Add Language drop-down list and then to click on the plus (+) button next to that list. You will notice how the newly added language will appear as a separate smaller section just below that list and there you will be also able to specify the CSV file for that localization. Once you are ready with these changes please click on the Save button located at the bottom of the page so you can be able to save the performed changes. Congratulations! 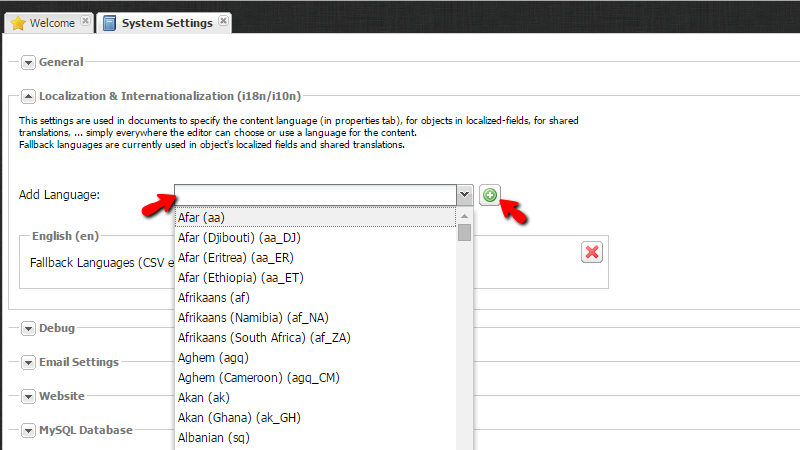 You can now configure the General and the Localization Settings of your Pimcore application!